Tunisian President Zine al-Abidine Ben Ali has condemned violent protests over unemployment as "not acceptable", and has vowed to punish rioters. He said the demonstrations, which have been held mainly by graduates, would hit tourism and jobs. Hundreds of protesters took to the streets of Tunis on Monday to demand jobs and an end to corruption. On Friday, one protester was shot dead during violent clashes in the central town of Menzel Bouzaiene. "The use of violence in the streets by a minority of extremists against the interests of their country is not acceptable," Mr Ben Ali said in a speech broadcast on Tunisian television. "It will have a negative impact on creating jobs. It will discourage investors and tourists which will hit jobs." He added that the law would be "applied in all firmness" to punish anyone found to be instigating violence and disorder, according to AP news agency. However, he also said that he would seek to find a solution to the problem of unemployment and to improve the standard of living. Demonstrations were sparked by the attempted suicide earlier this month of a jobless graduate, Mohammed Bouazizi. The 26-year-old sold fruit and vegetables illegally in Sidi Bouzid because he could not find a job. According to the Tunisian League for the Defence of Human Rights, he doused himself in petrol and set himself alight earlier this month when police confiscated his produce, telling him he did not have the necessary permit. Later, another young man electrocuted himself in the same town, saying he was fed up with being unemployed. In Tunis on Monday, Sami Tahr, head of the union for high school teachers said the demonstrators sought radical solutions to the country's problems. "We're gathered today in solidarity with the population of Sidi Bouzid and to salute the memories of the martyrs of repression who seek only their right to work," AP reported him as saying. 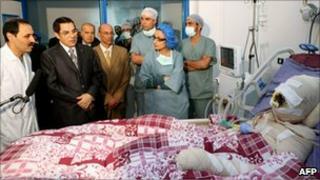 Protests are rare and political dissent is often repressed in Tunisia, which has been run by Mr Ben Ali for 23 years.